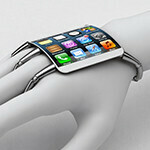 Check out this video rendering of a wearable iOS device - is it the future? As we reported late last year, Apple has a small number of employees working on prototyping iOS-driven wearable computing devices. It’s nothing like the effort put into Google’s Project Glass, but with the popularity of watch-band accessories for the touchscreen iPod Nano Apple clearly wanted to stay on top of the trend. In particular they were said to be exploring a wrist-worn curved glass display, presumably something like an iOS watch that would be thinner than the iPod Nano + wrist strap holder. Designer Federico Ciccarese, who frequently creates renders of potential Apple products, has a rather more unique take on this product. He seems to envision the device more as a primary mobile device, with a larger screen that you would let you use more advanced apps than a watch with a Nano-sized screen would allow. The design is certainly distinctive, with an almost arachnid-like feel when the device isn’t being worn. Would you be interested in a wearable computer from Apple like this? Would you prefer a more discrete watch-sized device, or are you holding out for Google Glass-like computer that can be worn on your head? That Sharp Sh*t will enter into my Skin !! Looks like Apple stole some design cues from Alien's face hugger. I wonder if Ridley Scott patent the design.... I see it now, Apple sues Ridley for stealing their shape when he made Alien in 1979. Why not JUST make it look like a watch? Did someone patent the watch design already? Probably not....but since Android is on a watch now.....Apple will probably do that and just sue the hell outta Google. Or Apple will somehow link it back to the that tiny iPod Nano and sue. Well...that's the end of that then.....lol. Thanks for the info. i wonder if those claws embed in your skin so u can never leave it or change you mind. mayb administering brainwashing drugs directly into your blood stream for more effective control over their "loyal customers/sheep". that POS won't even fit evrybdy. all hands are different. it'd be a b!tch trying to fit each individual person. but then again apple would prolly sell adapters to make it fit different ppl and charge alot for those too. also for some reason i don't know why it reminds me of the power glove by nintendo. Looks like something from War of the Worlds. Samsung will make something like this long before Apple does, they already have flexible screens that are being tested for such uses. This begs the question, who's bright idea was to make it so draconian in appearance? Seriously, you embrace technology, not the other way around. exactly, Samsung's idea and prototype of flexible screen has been out now for a while. Plus, who is going to wear such a thing?! looks so boyish and silly. http://www.ciccaresedesign.com/ Some interesting designs from this guy. I've got a new follower, thumbs down every single post, regardless of content. Get a life. Its sad....but dont worry about it. Just shows some folks have no life. Here's one green thumb from me for ya. Now watch how many red thumbs I get...LOL!!! Sure, why wouldn't they? Just another Apple device to buy. Profit profit profit. I'd rather just have a forearm sleeve I can slip my phone into and out of. Seems more practical. Those little metal bars look pretty and all but also look like a hindrance to dexterity and flexibility. Or even a point of injury. Plus it's not safe for drivers, both hands off the steering wheel. Next apple's innovation, the icondom.